3. What Now? Start Studying! 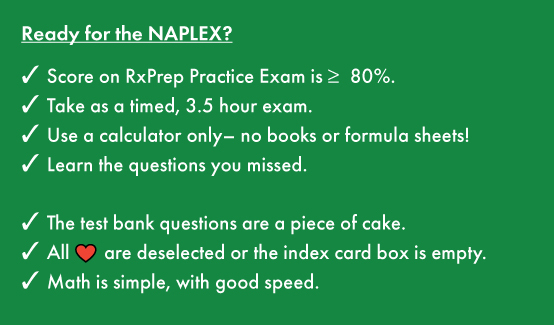 Read “How to Use the RxPrep Course Book” and “Preparing for NAPLEX with RxPrep” (Chapter 1) in the 2019 RxPrep Course Book. If you have Online Course access, watch the “Preparing for NAPLEX with RxPrep” video along with Chapter 1. This chapter includes the top selling (commonly used) OTC, outpatient and inpatient drugs, and diagnostic terms. Learn them first so you can handle the clinical chapters. A free assessment test in Top Sellers will help. It's in the RxPrep store– scroll down to find it. 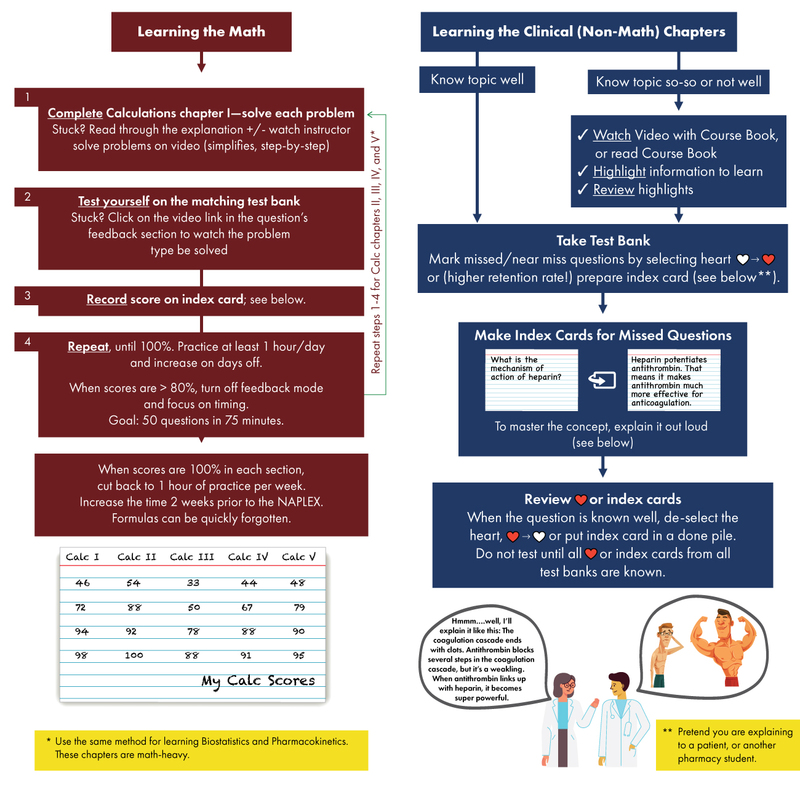 Complete RxPrep’s Free Assessments in Math Basics and Top Seller Drugs. If scores are < 100% and additional practice is needed, RxPrep Pharmacy Basics: Math Basics and Top Seller Drugs can be purchased. The RxPrep Course Book chapter called “Calculations I” explains how to solve the math that is tested in Math Basics. To learn brand/generics, the list of “Prescription Top Sellers” in the Appendix is helpful. 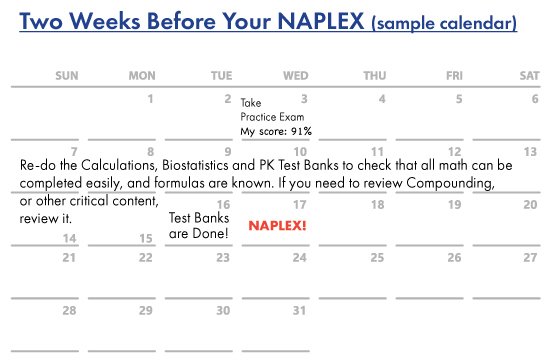 Once scores are 100% in the Free Assessment Test Banks, begin NAPLEX preparation using the 2019 RxPrep Course Book. The goal is to master all of the RxPrep material before testing. A customized study plan is essential to your success. This 8-Month Study Plan requires mastery of an estimated 8 to 14 chapters per month; it may be lengthened or shortened based on individual time commitments. It is advised that calculations be completed before beginning clinical topics. The study plan was designed in blocks of approximately equal time commitment. It can be customized to align with learning objectives of APPE rotations by interchanging topics of the same color between blocks or interchanging entire blocks (all green, yellow and red topics). Customization of the study plan is illustrated in the examples below. Place an “X” on any day you will not be able to study due to other commitments. Then, find the topics that correspond with each block and insert into the schedule. Use the color scheme in each column above to determine how much time to allow for each topic. Topics do not need to be completed in order but all topics should be completed by the end of each month. Remember to complete the calculations chapter first and continue to practice calculations throughout the remaining blocks. Two weeks prior to test date, repeat key test banks such as Calculations, Biostatistics, Sterile and Non-Sterile Compounding. Take the 2019 RxPrep Practice Exam. A score ≥ 80% indicates readiness to test. Jessica is starting her first APPE rotation in a hospital setting. She will be preparing sterile products. She chooses to complete calculations during her first week to make sure she has good foundational knowledge. Tuesdays are expected to be busy days because she has normal rotation duties and grand rounds. She works every other weekend at a local pharmacy. She chooses to complete a medium size yellow topic on the weekend, to make the weekdays less stressful. Jessica has completed introductory rotations and is moving on to a specialty rotation in emergency medicine. She plans to complete the critical care and emergency preparedness topics and test banks prior to starting the rotation, so she selected block 5 topics for this month. Her preceptor has assigned her a presentation on seizures, so she is completing epilepsy/seizures instead of HIV. She continues to work every other weekend. Follow your customized study plan and master the material in each chapter. Adjust your study plan if topics take longer than you expected. Approach the chapters as described below.